I am always reticent to jump on the digital donor recognition bandwagon. A client has to fully convince me that the organization has significant reasons to use digital media and the commitment to maintain it over time. Here are the ten questions I ask in the process of investigating the appropriateness of digital donor recognition. Some relate to clarifying your needs, some to readiness and sustainability and some to design. Don't get me wrong, if enough of the answers point to the use of digital donor recognition, I'm game! 1. What is the scope of information to be included and what are the priorities? There is a tendency to include everything PLUS the kitchen sink in digital displays. The options are endless, the vendor is enthusiastic and it's all promised at the same "cost". However, too much content is confusing and all information has to be presented in a logical hierarchy. What is the single most important thing to present? What is the first–and likely only–thing most viewers will see? Does that single view communicate as much of the message as possible? 2. Who will gather, write and provide graphics for the initial content? Outside resources can work miracles, but they have to have something to work with. What's the plan for gathering lists, stories, photos and other graphics? Does the long range plan require that some or all of these elements be updated? If so, who provides the information over time? Don't forget to think about required overlap with other teams like your communications department. 3. What level of interaction will be desired and/or required from your IT department? Most organizations have concerns about the interface between a public facing web portal and internal cyber security. Address those concerns early and while you're at it, confirm that you will have the necessary support–either from the inside or from your resource partner–for routine maintenance, technical support and hardware and software upgrades over time. 4. How important is remote access for you and those who help maintain the display? Monitoring the performance of the display is one concern. Updating content remotely is another. Providing online access to all audiences is now a realistic and often used option. 5. What is your budget? Digital donor recognition can be had at every price point. Have some idea of what you want to spend for initial development, installation and ongoing maintenance before you begin. Your guesstimate may prove inaccurate, but at least you have a point of comparison as the various ideas and price-tags come across your desk. 6. Have you established a clear calendar for implementation and updates of the display? Keeping the content lively and up-to-date is significantly easier if there is a pre-established vision for what should change, and when and from whom the new information will come. Throughout the year, be on the lookout for content that can be repurposed within the display and where the information prepared for the display might find other uses. 7. Is there shared responsibility for the display and its maintenance? If you win the lottery and move on, are there others in the organization ready and committed to maintaining the display you've designed? Are the hardware, software, resource contact information, update calendar and templates well-documented and readily available? Have you trained a "second" to manage the display? 8. Is there value to remote access for your donors and other external audiences? Most systems are now web-based. With preplanning, remote access by others is now practical to achieve and greatly extends the usefulness of your digital content. Fundraisers can reference it during visits, donors can share it with their friends. Expanding the ways in which information finds an audience greatly increases the return on investment for a digital donor recognition display. 9. What is being lost and gained in choosing electronic donor recognition? No matter how big the screen or complex the presentation, only so much information can be presented. From my perspective, what is most often lost is an understanding of the total volume of donors presented. What's gained? A more dynamic presentation with versatility and relative cost-efficiency. Most organizations address the compromise by housing the electronic screen(s) in an architectural environment that communicates the overall size, significance and impact of the donors and their giving. 10. How will you measure success? Most digital displays provide tools for counting the number of users and tracking the areas they choose to visit. Inevitably, organizations are disappointed by the data they receive about how the display is used, largely because expectations were not realistically set from the start. Very few people will use a touch screen in a public location. However, there are other measures of success that may better point to success. 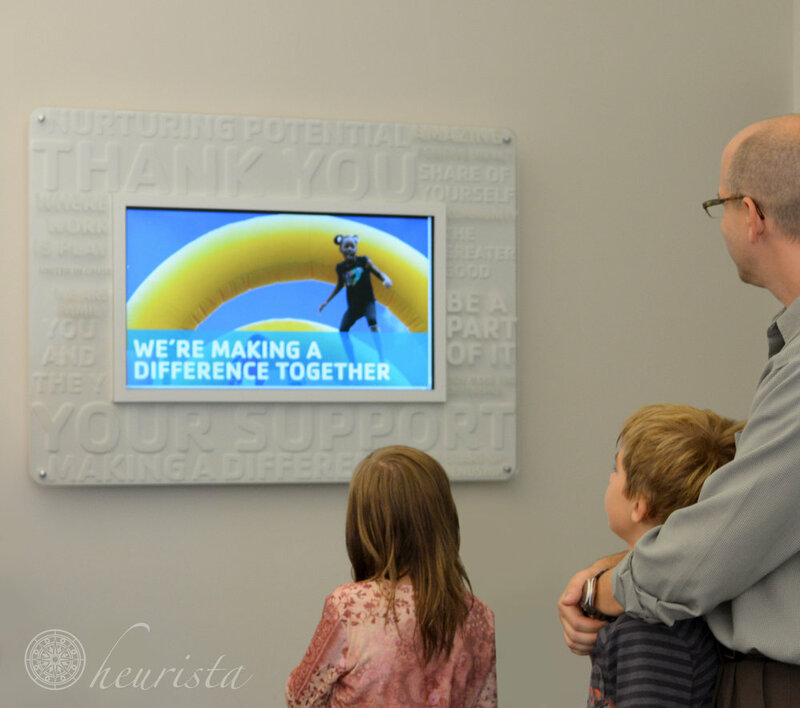 For instance, Heurista has worked with clients for whom bolstering a culture of philanthropy was a stated goal. Rather than measuring how many names or stories were read, we benchmarked awareness and understanding of philanthropy before and after the introduction of the digital display and used increases to report success and guide future improvements in the content of the display. Over time, stories were written to address the general audience, not the donor(s) specifically, thereby increasing attention and comprehension. If you are considering or already have a digital donor display, we would welcome the opportunity to talk with you about your goals, experience and challenges. I can be reached at anne@heurista.com or 828-505-7002.